How many men out there have wondered what it would be like to be the last man on Earth? For Yorick Brown, it’s not quite as cool as it sounds. 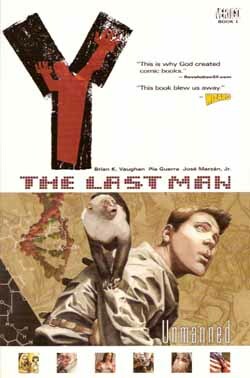 Y The Last Man: Unmanned takes place in 2002 where a plague suddenly kills all living mammals with a Y chromosome – except Yorick Brown and his pet monkey Ampersand. This apocalyptic disaster is built up in Unmanned in a more suspenseful way than most high-budget action movies are able to pull off. There are several stories happening at once, taking place all over the world 29 minutes before every man (approx 2.9 billion) suddenly die. Y The Last Man: Unmanned is an exciting read that you won’t be able to put down. What I thought was awesome about this comic is that touches on some many different topics: magic, science, politics, and social implications. For example – what role will super models play in a world with no men? The only reason I gave this comic 4 out of 5 stars is that it felt a little rushed to me. We never see the main character struggle with the fact that he’s the only man alive, while I would think that would leave somebody is a shell-shocked state for quite some time. At any rate, I highly recommend this book. There are so many reasons to like Y The Last Man as it seems to have a little something for everybody. I’m looking forward to checking out more book in the series.